Let’s consider some ways of exporting the Exchange Global Address List (GAL) to a text CSV file. In this format, the contact list from the corporate address book can be transferred and imported into the contacts of third-party email clients or online email services. Let’s deal with some export tools: these can be Exchange Management Console, Powershell, MS Access or csvde utility. In fact, there are no tools to export Exchange Global Address to any format in MS Outlook. You can export only your personal address book, but it’s quite troublesome to copy all GAL recipients to it. 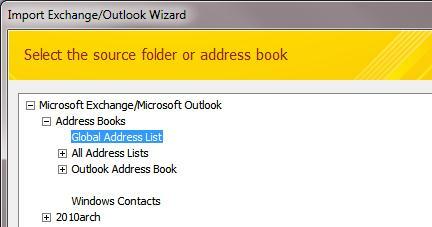 The easiest way is to export the address book right in the EMC console. 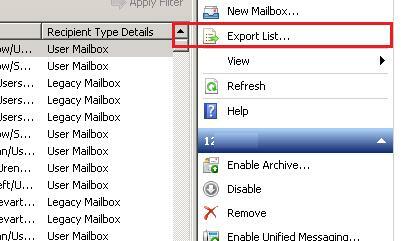 To do it, go to Mailbox section and in the right-hand column select Export List. But you need to have access to the Exchange console to do it. To import the AD data, you can use a console utility csvde.exe. And finally, the least evident, but quite simple and clear way to export GAL for a common user — with the help of Access database. A flat Access table with the address book info is obtained. Now you can export it from the database to CSV or Excel file. It is enough to import the CSV file you got in Excel and modify it as you need.